Marriage needs at least three different kinds of support: preparation, prayer, and practical advice. Through this blog, I'm trying to offer all three. Please join in the community and add to the conversation, so that we can all support each other. 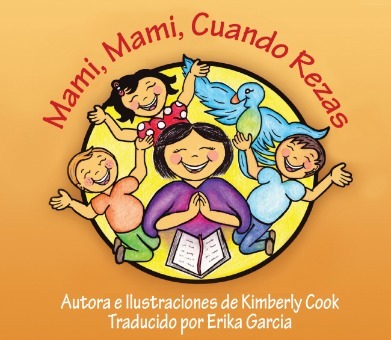 It was my pleasure to introduce my kids to Kimberly Cook's delightful little book Mami, Mami, Cuando Rezas -- the Spanish-language translation of her book Mommy, Mommy, When You Pray. It provided me with the perfect opportunity to make headway on my New Year's resolution to teach our kids more Spanish! Mami, Mami, Cuando Rezas is a picture book of about 25 pages. The amazingly talented author also illustrated it herself. The color palette is a vibrant mix of turquoise, purple, and a sunny golden yellow, with some red thrown in for emphasis. Using just a sentence per page, the author explains how she prays constantly in gratitude for the wonderful children that God has given her -- a terrific message for any child to hear. I was curious to see how much my children could understand based on their parochial school Spanish lessons of once or twice a week. Our fifth-grader Maria could understand the book on her own, with the help of the cheerful illustrations of the family members, playing, praying, and laughing together. My younger daughters, Marguerite and Cecilia, loved reading the book with me, pointing out the words they recognized and learning new ones, too. And our kindergartener Elisa-Maria was thrilled that the little girl in the pictures looks so much like her! Spanish is becoming more and more important for our kids to learn, as the number of Spanish speakers in the United States increases year to year. In 2010, the number had reached 37 million. Approximately 30 million of those people are Catholic. Surprisingly, given such a large population, it's hard to find Spanish-language kids' books with religious themes. That's what makes Mami, Mami, Cuando Rezas truly a treasure. This looks like a nice book! Thanks for the review. Yes, it's a wonderful book. Thanks so much for visiting and commenting! For your FREE EBOOK, subscribe here!! Let God work miracles in your marriage! Nothing in this blog is meant to provide medical, legal, or spiritual advice to any particular person or in any particular situation. Consult your own doctor, lawyer, or priest. Comment moderation has been turned off in the hopes that it will encourage respectful dialogue. Hostile or disrespectful comments will be removed.